Wedding menu cards are one aspect of wedding stationery that is often left to the last minute. While menu cards are optional, your guests will likely appreciate them. While wedding menu cards are certainly considered to be an “extra” day-of paper good, don’t discount the value of informing your guests on the details of their meal. 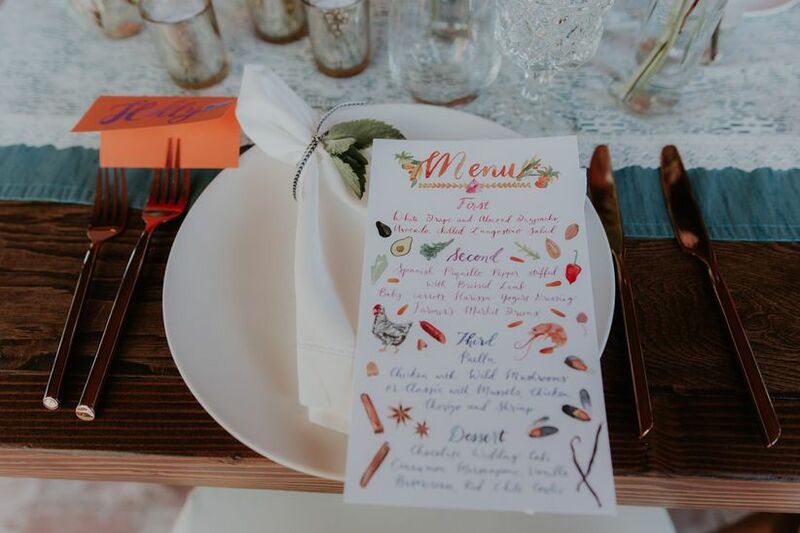 Not only do menu cards help enhance the overall table design and entertaining experience, but they can be a practical way to accommodate your guests with dietary restrictions. Ready to get your wedding menu cards in the works? We’re giving you the complete run-down of what to include, how to display them, and everything in between. Are wedding menu cards necessary? In short, wedding menu cards aren’t an essential piece of stationery, but that doesn’t mean they aren’t worth seriously considering. Just like a restaurant menu details the specifics of your upcoming meal, menu cards serve a practical purpose by outlining meal courses (usually including brief descriptions and/or main ingredients) so your guests know exactly what they’ll be eating. This information can be particularly helpful if you have guests with food allergies or sensitivities. For example, are there toasted walnuts in the salad or a cream sauce on the chicken? Guests with dietary limitations will appreciate those details so they can enjoy their meal without stressing. 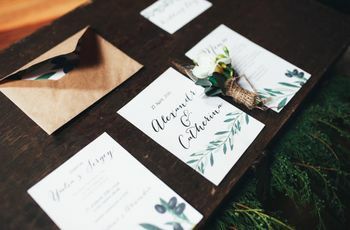 If individual menu cards aren’t within your budget, some couples opt for a large menu board to display as their guests enter the reception space. Or, they’ll include just one or two standing menus per a table. Either of these options can be excellent cost-effective solutions to serve your guests without spending top dollar. A typical wedding menu card outlines the meal courses, including starters, entree, and dessert. Of course, this can look differently depending on the formality of your reception and how many courses will be served. It’s also standard to include a brief description or a list of main ingredients directly below each course heading. Touch base with your caterer for these details and work together on the content of your menu cards for a seamless process. Keep in mind that wedding menu cards aren’t just for plated dinners but can also be used for buffet style or food station meals. Communicating what your guests will be eating is a courtesy they’ll appreciate no matter the formality of your event. 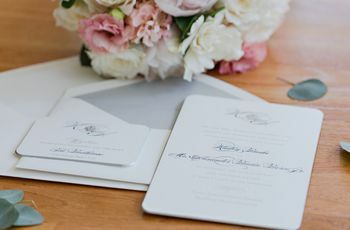 Just like any other part of your wedding day stationery, make sure the design of your menu cards isn’t an afterthought. 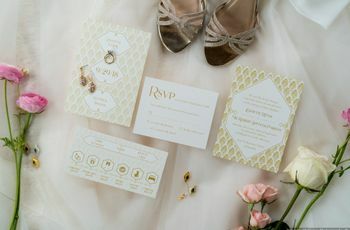 If you’re working with a professional stationer, they’ll be able to ensure all your day-of paper elements—from ceremony programs to place cards, menus, and more—include the same fonts and style features so your big day feels cohesive down to the very last detail. 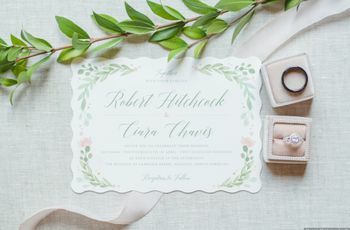 Some couples choose a custom monogram that carries throughout all their paper goods, while others maintain design consistency with the same colors, calligraphy, or artwork. If you’re looking to personalize your wedding menu cards even further, think about including a special thank-you note to your guests at the top or bottom of the card. 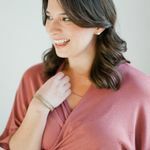 This gives you an opportunity to express your gratitude for their love and support of your marriage in a meaningful way. Menu cards are practical for many reasons, but they also add an element of style and formality to a special occasion. They enhance the guest experience by detailing meal courses, and can really add to your table design when thoughtfully styled. For a classic look, place each wedding menu card directly on top on the charger plate, napkin, or even tucked inside a pocket-style folded napkin. You can also choose to style them upright in a small menu card holder by including one at each place setting or one or two per a table. No matter how exactly you choose to style your wedding menu cards, it’s certain your attention to detail won’t go unnoticed.